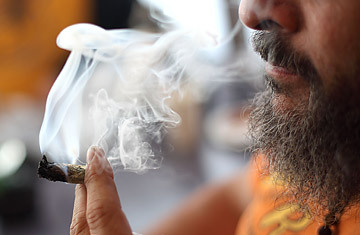 A man smokes marijuana in Berkeley, California. But here's the conundrum: while marijuana went from being a secret shared by a small community of hepcats and beatniks in the 1940s and '50s to a rite of passage for some 70% of youth by the turn of the century, rates of schizophrenia in the U.S. have remained flat, or possibly declined. For as long as it has been tracked, schizophrenia has been found to affect about 1% of the population. One explanation may be that the two factors are coincidental, not causal: perhaps people who have a genetic susceptibility to schizophrenia also happen to especially enjoy marijuana. Still, some studies suggest that smoking pot can actually trigger the disease earlier in individuals who are predisposed, and yet researchers still aren't seeing increases in the overall schizophrenia rate or decreases in the average age of onset. In recent months, new research has explored some of these issues. One study led by Dr. Serge Sevy, an associate professor of psychiatry at the Albert Einstein College of Medicine in New York City, looked at 100 patients between the ages of 16 and 40 with schizophrenia, half of whom smoked marijuana. Sevy and colleagues found that among the marijuana users, 75% had begun smoking before the onset of schizophrenia and that their disease appeared about two years earlier than in those who did not use the drug. But when the researchers controlled for other factors known to influence schizophrenia risk, including gender, education and socioeconomic status, the association between disease onset and marijuana disappeared. Gender alone accounted for a large proportion of the risk of early onset in Sevy's study, which included 69 men and 31 women. "Males in general have earlier age of onset of schizophrenia," says Sevy. In men, the disease tends to take hold around age 19, while in women it isn't typically seen until 22  irrespective of marijuana use. But, typically, teenage boys are four times more likely than girls to be heavy pot smokers, which may create an illusory association between the drug and onset of the disease. Yet past studies limited to males have found exactly such a link, associating marijuana use with earlier development of full-blown psychosis. And other research has found that ongoing cannabis use increases hospitalizations for psychotic symptoms in schizophrenic patients and decreases social and cognitive functioning. A 2008 review of the data found that relapse and failure to take prescribed medication was consistently associated with cannabis use, although, again, controlling for other factors weakened the link. One explanation could be that the effects of marijuana vary depending on the genetics of the individual patient's schizophrenia. Marie-Odile Krebs, professor of psychiatry at the National Institute of Health and Medical Research (INSERM) laboratory in France, and her colleagues published a study in June that identified two broad groups of people with schizophrenia who used cannabis: those whose disease was profoundly affected by their drug use and those who were not. Within Krebs's study population of 190 patients (121 of whom had used cannabis), researchers found a subgroup of 44 whose disease was powerfully affected by the drug. These patients either developed schizophrenia within a month of beginning to smoke pot or saw their existing psychosis severely exacerbated with each successive exposure to the drug. Schizophrenia appeared in these patients nearly three years earlier than in other marijuana-users with the disease. See photos of the great American pot smoke-out. Read about how to grow medical marijuana.